The decision of the Danmarks Nationalbank to lower its policy rate below zero in July 2012 was an important extension of monetary policy. We have had non-standard monetary policies, such as quantitative easing and forward guidance, since the Global Crisis of 2008, but negative nominal interest rates in Denmark represented an unprecedented leap across the mythical zero lower bound (ZLB). Of course, the ZLB has subsequently proven to be quite porous, as Switzerland, Sweden, the euro area, and Japan have also enacted negative rates. However, before this exploration into negative territory there were concerns that financial institutions – deposit-taking banks in particular – would be dramatically and negatively affected by negative policy rates. A number of earlier studies found that banks experienced difficulties when rates were low, though positive. For example, Borio et al. (2017) found that banks were less profitable at low rates of interest, and that the sensitivity of profitability to rate reductions grows as interest rates fall. Claessens et al. (2018) found similar results, driven by reductions in net interest margins. Borio and Gambacorta (2017) also found that bank lending becomes less responsive to reductions in policy rates as those rates approach zero, suggesting that the financial channel of the monetary transmission mechanism is weaker at this point. Now that banks have actually experienced negative rates in a number of countries, we can assess their relative ability to cope with the challenges of crossing the ZLB. In particular, we can observe how banks responded to these policies, and the implications of those responses for the financial transmission channel of monetary policy. Our research into this question (Lopez et al. 2018) suggests that banks were able to cope relatively well with negative interest rates, although we should question the sustainability of their strategies over longer periods if rates remain negative. Our analysis examines annual balance sheet data from more than 5,000 banks in the EU and Japan between 2010 (before negative nominal rates) and 2016 (the most recent year available for all the banks). A large sample of banks across 14 currencies allows us to examine a variety of countries that 'went negative' at different times and for different reasons. We also compare the fortunes of these banks with institutions in similar countries that did not experience negative rates during our sample period. Overall bank net income – total bank income minus expenses – appears not to be affected by negative nominal interest rates, at least compared with low positive rates. This finding supports results in earlier studies, largely based on samples of banks from a single currency regime. For example, the research done by Basten and Mariathasan (2018) on Swiss banks. Moreover, relative to earlier studies, our sample has more small banks (by asset size) and more banks that are rely heavily on deposit funding (high-deposit banks). Banks in both of these categories claim to have greater exposure to losses under negative interest rates. But more detailed income and balance sheet data reveals notable effects below this headline income figure. Figure 1 shows our model-implied ratios of net interest and net non-interest income, relative to total assets, for banks in our sample during periods of positive policy rates (the blue bars) and negative rates (the orange bars). Source: Lopez et al. (2018). Banks experienced significant declines in net interest income. This is the income from loans and bond holdings minus expenses such as interest paid on deposits and other outstanding debt; as shown in the figure, the decline was from 0.02% of total assets to -0.03%. Notably, banks did not substantially reduce deposit expenses, consistent with the assumption that nominal deposit rates are sticky at zero. 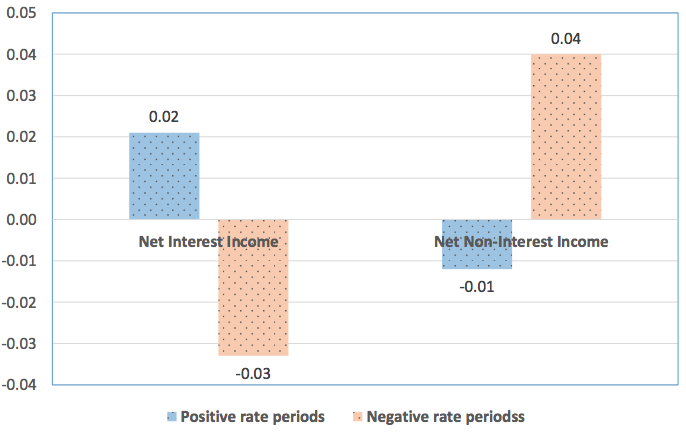 The reduction in interest income under negative interest rates was different across bank size. Large banks (greater than $10 billion in assets) appear to be more capable of lowering their deposit expenses, whereas changes in small bank deposit expenses were insignificant. Banks mitigated the losses on net interest income by generating significant increases in net non-interest income. As shown in the figure, this income ratio rose to 0.04% under negative policy rates, from -0.01% under positive rates. These increases were due almost entirely to increased non-interest income, from fees and from other sources such as capital gains and gains on securities. Here again, large banks were better able to reduce their non-interest expenses, such as salaries, than their smaller counterparts. These results suggest that banks adjusted their operations to offset the expected decline in interest income under negative rates by generating additional non-interest income. This is especially true of specially smaller and more deposit-dependent banks. These adjustments maintained their income levels, but it is an open question whether this is sustainable. In particular, capital gains on securities when policy rates drop below the zero bound are unlikely to endure just because rates remain negative. As noted in the report by the Committee on the Global Financial System (CGFS 2018), banks are likely to continue to make structural changes in their operations to respond to the effect of negative rates on bank profitability. The health and viability of banks and other financial firms are key drivers of the macroeconomy and monetary policy, and the results suggest that it is best to be guarded in our optimism about their continued viability under negative rates. Our results mirror those in earlier studies of low rates, and suggest that banks have fared reasonably well under negative nominal interest rates. But the increased non-interest income enjoyed by banks under negative rates may be unsustainable. Capital gains on securities following negative interest rate surprises are unlikely to endure for long. Nevertheless, concerns about the financial channel of the monetary transmission have not been realised, which argues against the need to adjust our long-term monetary policy assumptions. We would recommend caution, however, in concluding that bank performance and lending is sustainable over extended periods of negative or low-for-long policy rates. Basten, C and M Mariathasan (2018), “How Banks Respond to Negative Interest Rates: Evidence from the Swiss Exemption Threshold”, CESIFO working paper 6901. Borio, C and L Gambacorta (2017), “Monetary policy and bank lending in a low interest rate environment: diminishing effectiveness?” Journal of Macroeconomics 54(B): 217-231. Borio, C, L Gambacorta, and B Hofmann (2017), “The influence of monetary policy on bank profitability”, International Finance 20: 48-63. Claessens, S, N Coleman, and M Donnelly (2018), “‘Low–For-Long’ interest rates and banks’ interest margins and profitability: Cross-Country Evidence”, Journal of Financial Intermediation 35: 1-16. Committee on the Global Financial System (2018), “Financial Stability Implications of a Prolonged Period of Low Interest Rates”, CGFS Papers 61. Lopez, J A, A K Rose, and M M Spiegel (2018), “Why Have Negative Nominal Interest Rates Had Such a Small Effect on Bank Performance? Cross Country Evidence”, NBER working paper 25004.